Boy loves balloon. Boy loses balloon. Boy breaks down, grief stricken. Slowly, heartbreakingly, skies clear and boy learns to smile again. Gentle reader captivated by artwork. Gentle reader smitten with boy. Gentle reader catches balloon-like lump in throat. Slowly, pitifully, tears subside and gentle reader comes to grips with loss. 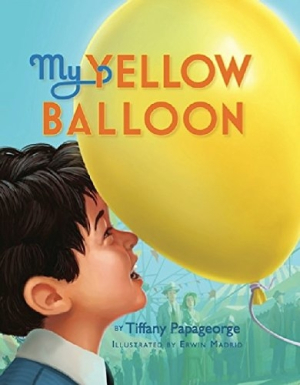 All helium and hyperbole aside, My Yellow Balloon is a masterpiece of story and art.